You can use jd-gui on Kali with just two steps. Download jd-gui repo for Kali from : Kali Git Repositories . Unzip the repository. You can see the jd-gui-1.4.0.jar. Just run the jar file from command prompt. First of all you have to download the Android SDK. The latest SDKs are available at the Android Developers website. The downloaded SDK contains only the core SDK tools, so you will have to use the SDK Manager executable file to download and install or update SDK components such as platforms, tools, add-ons, and documentation. I have experiences with developing Android applications using Eclipse IDE. So the examples i discuss here uses Eclipse IDE. 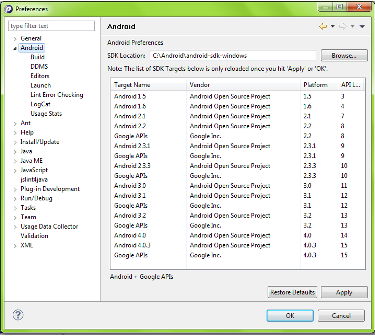 In order to develop android applications with Eclipse IDE the Android Development Tools (ADT) plugin should be installed in Eclipse IDE. In Eclipse IDE there is a option called “Install New Software” under the “Help” menu item. There you can add the ADT plugin. There are two ways which you can add the ADT plugin to Eclipse IDE. The first one is to use the https://download.eclipse.org /releases/ url which download the ADT plugin and install it in IDE or the other is to download the ADT plugin in to a local location in your PC and give that location to the “Add Repository” dialog. 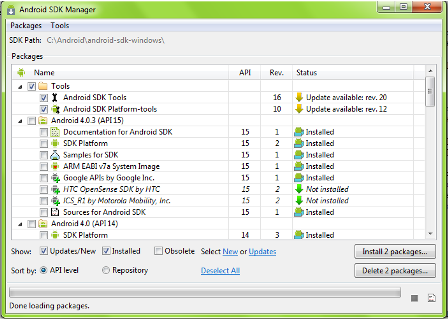 Now you can use the “Android SDK Manager” icon available with the Eclipse IDE to download the platforms and other tools. In order to create an application you have to install at least one version of SDK platform. Each API package contains a list of components and you can download all the components at once or the most necessary ones.